Look at this photo and tell me that you wouldn't kill for that view of the Arc de Triomphe. I know that I would. 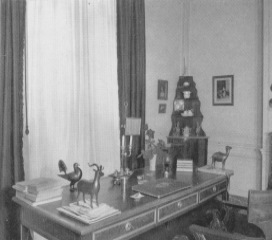 It's a good thing that the bureau plat and chair were placed with their backs to the window, because had it been otherwise, I doubt any work would have been accomplished. 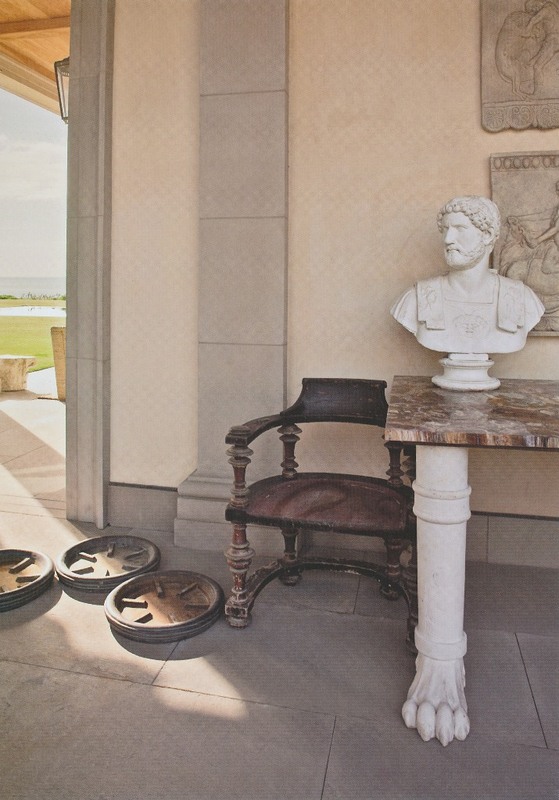 I love to find photos of interiors that boast amazing views. 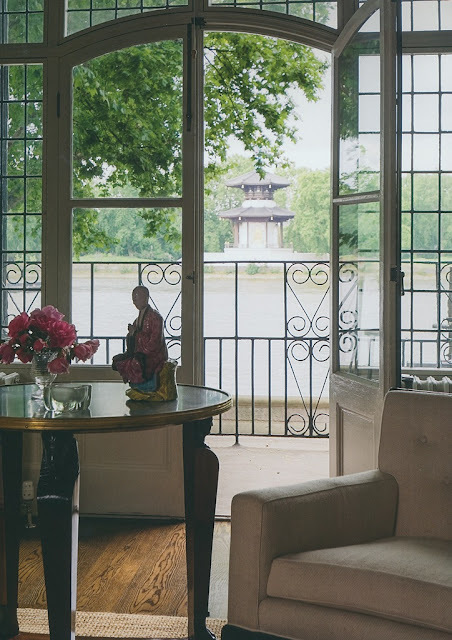 Whether it's a Paris monument, a bucolic vista, or even a simple but majestic tree, a good view almost manages to make a room's interior play second fiddle. In these situations, attractive interiors are simply the icing on the cake...or perhaps it's the view that is the cherry on top. Well, whatever. A killer view and a lovely room from which to view it truly are beautiful sights to behold. 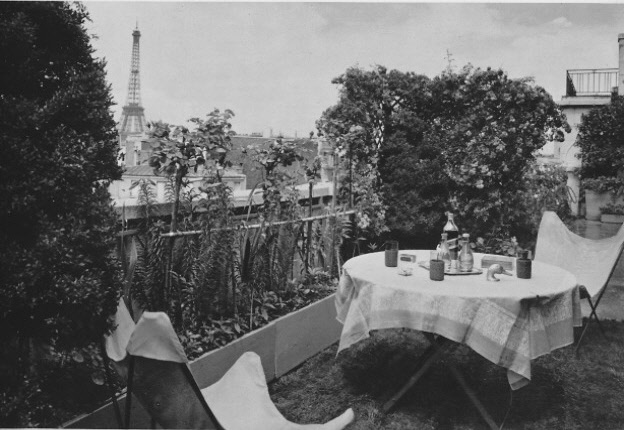 This Paris rooftop garden had a great view of the Eiffel Tower, which could be enjoyed while sitting in butterfly chairs. The grass, by the way, was plastic. Madame Ralli's Paris rooftop garden boasted this view of the Hôtel des Invalides. 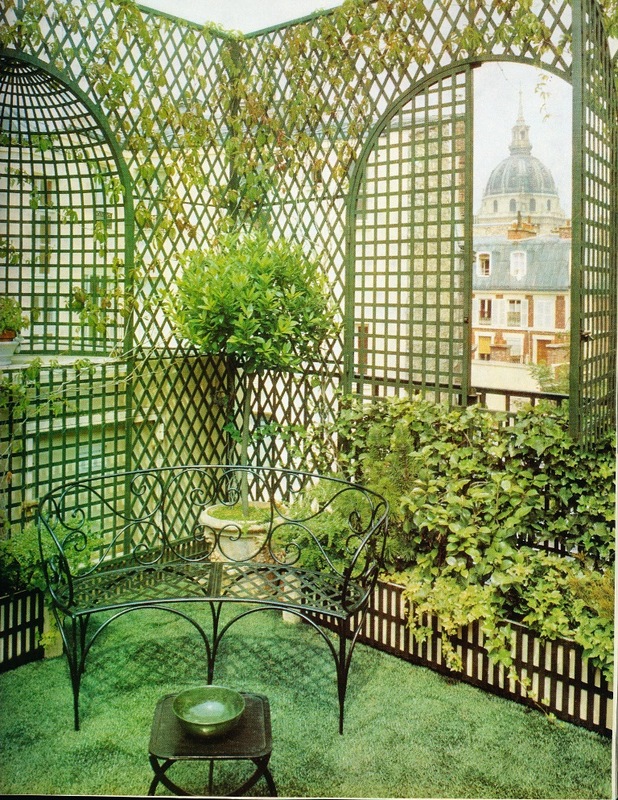 The Vicomte de Noailles advised Ralli on her urban oasis, which also featured plastic grass. I can only conclude that plastic grass must have been the dernier cri at the time. 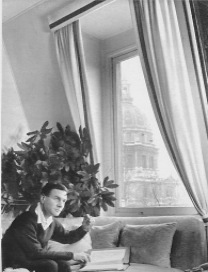 Evidently, quite a few chic people lived with stunning views of the Hôtel des Invalides, including the late Walter Lees, who was so inspired by the scenery outside of his window that he had napkins embroidered with the landmark's motif. Author Gordon Merrick posing in front of his view of the Hôtel des Invalides. The riverside pavilion at Syon boasts a view of the Thames, too. 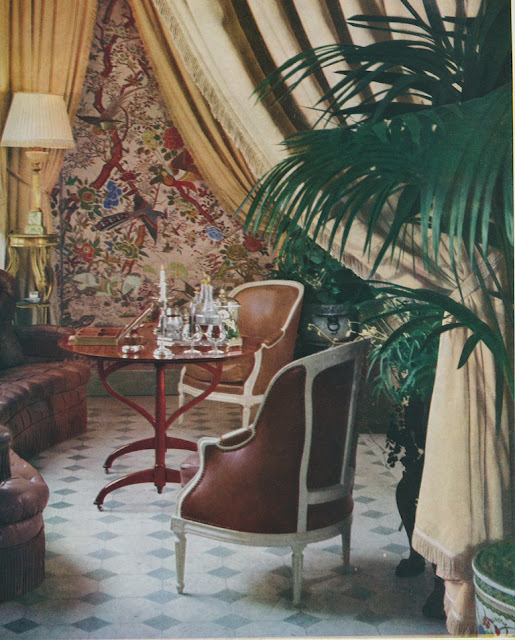 This photo from the 1960s shows interiors that were the work of R A P Pinckney. A majestic tree stands beyond the window at Villa Agnelli in Turin, Italy. 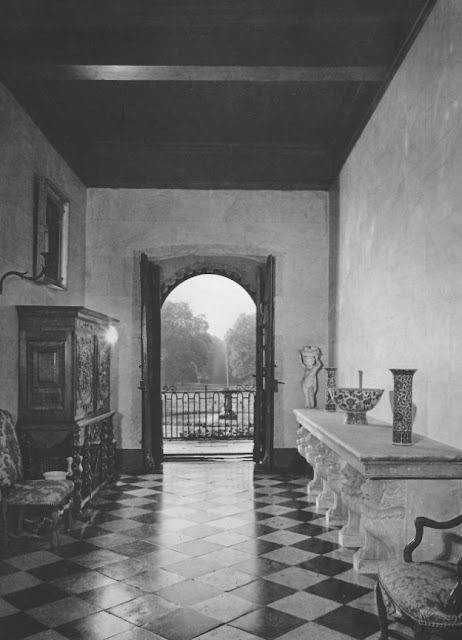 An arched doorway frames this view of a fountain at château de Fléchères. Cole & Son recently debuted their new Fornasetti II collection of wallcoverings, and I think it's a breath of fresh air...or maybe that should be flair. 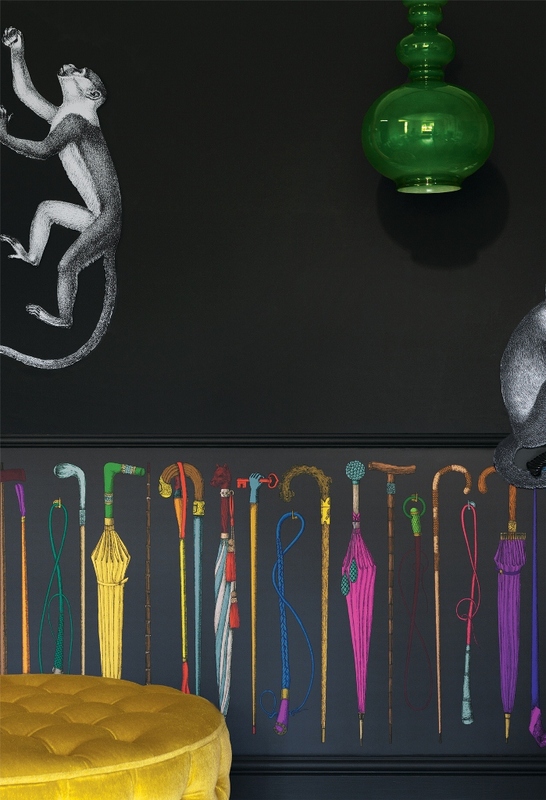 Available in the U.S. through Lee Jofa, the collection features all kinds of eccentric designs such as pen nibs, umbrellas, walking sticks, and trompe l'oeil architectural niches. 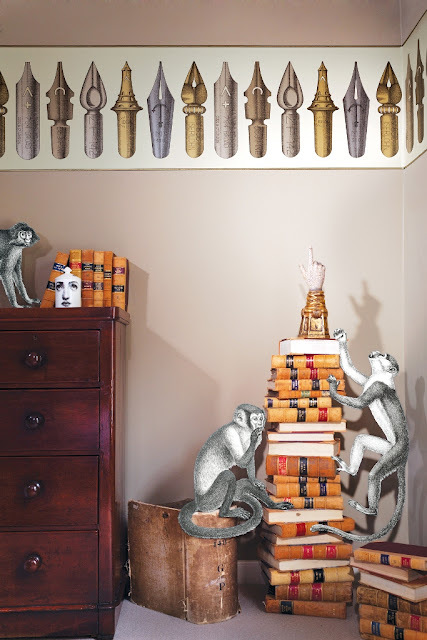 Rather than seeming silly, though, these designs are quintessential Fornasetti, dashing in appearance and plucky in attitude. Take, for example, Magia Domestica, seen above. It's a classic trompe l'oeil design with its open door, suit of armour, bookshelves, and drawn curtains. On the other hand, Nuvolette, a white and black cloud design paper, is probably more versatile and suitable for those who prefer subtlety. Regardless of whether you're a design renegade or someone who can tolerate just a hint of humor, you should take a look at the new collection. Fornasetti's designs are truly unlike any other. 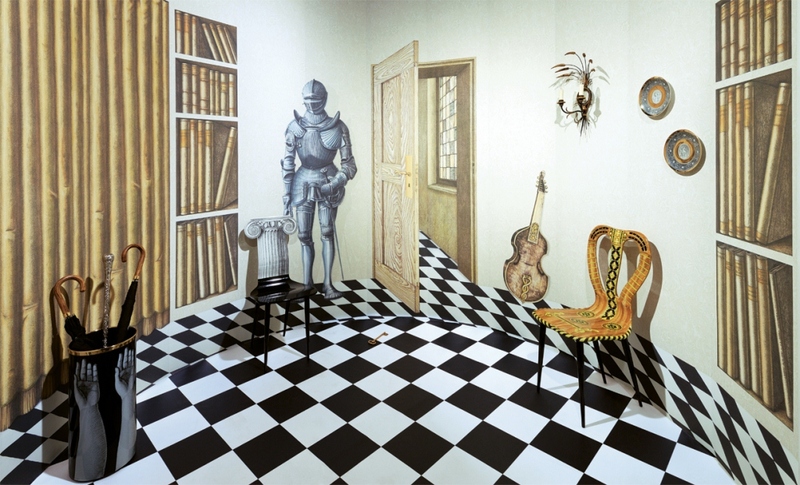 I would paper the walls of a small foyer or coat closet with Promenade. Or, perhaps the dressing room of a dandy? Recently, I have seen Nuvolette used in two different showhouses, and both times, the paper was used to stylish effect. I also think this print might be the most versatile of the collection. I believe that I like Uccelli's border almost as much as its menagerie of colorful birds. Pennini has masterpiece written all over it. ...or without (simply Procuratie). 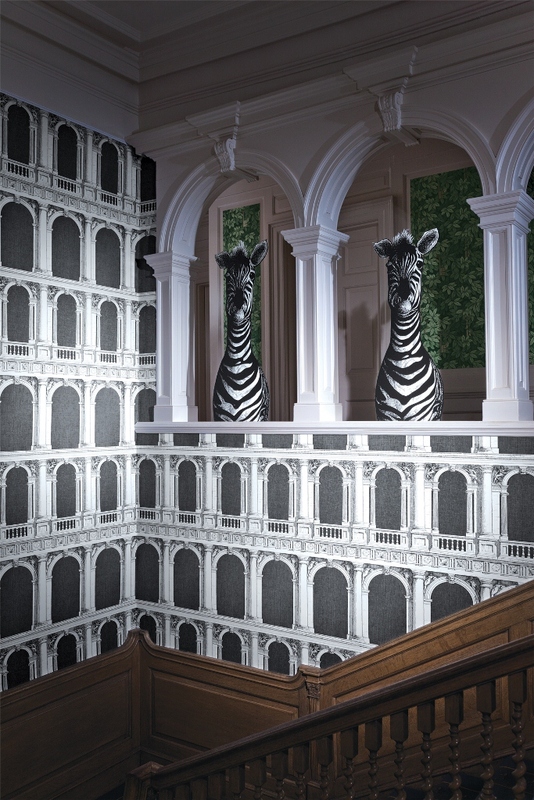 The zebras peeping through are not part of the new collection. All images courtesy of Lee Jofa/ Cole & Son. This year, we're seeing a Christian Dior revival. Not that the famous couturier was ever really far removed from our radars. 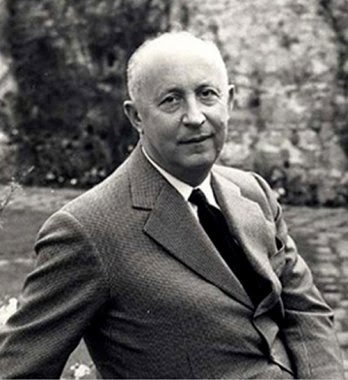 We still invoke his name as one of the twentieth century's great tastemakers (that term is overused today, but Dior was a tastemaker in the truest sense of the word), and photos of his fashions still abound in books, magazines, and, of course, the internet. 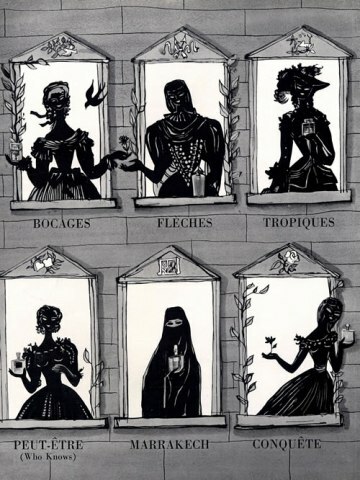 But, this year, Dior's work and legacy are more front and center than they usually are. There is the exhibition, Impressions Dior, which is currently installed at Musée Christian Dior in Granville, France. The show explores Dior's work through the prism of Impressionist art, asserting that the couturier was influenced by nature (especially his garden), light, and reflections, just as Impressionist painters were. 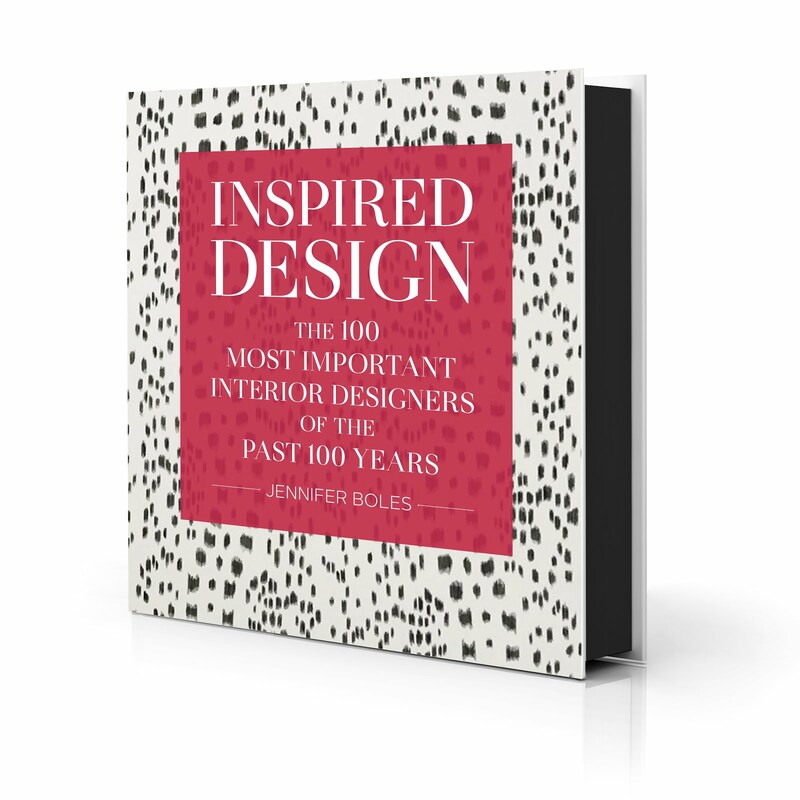 The show runs through September 22, but for those of us who might not have the opportunity to visit it in person, there is a soon-to-be-published book, Dior Impressions: The Inspiration and Influence of Impressionism at the House of Dior, that accompanies this exhibition. 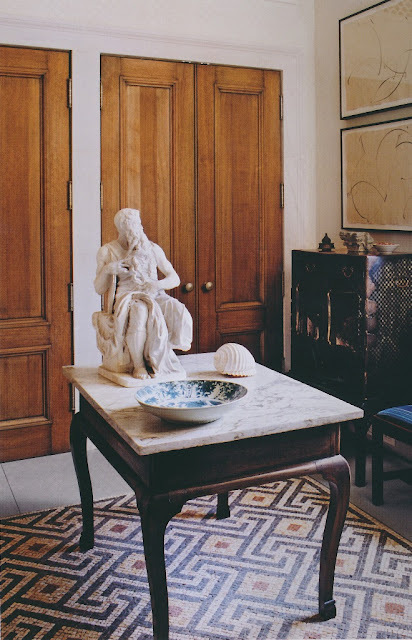 So, in honor of all things Dior, I am featuring photos of Dior's Paris l'hotel particulier. 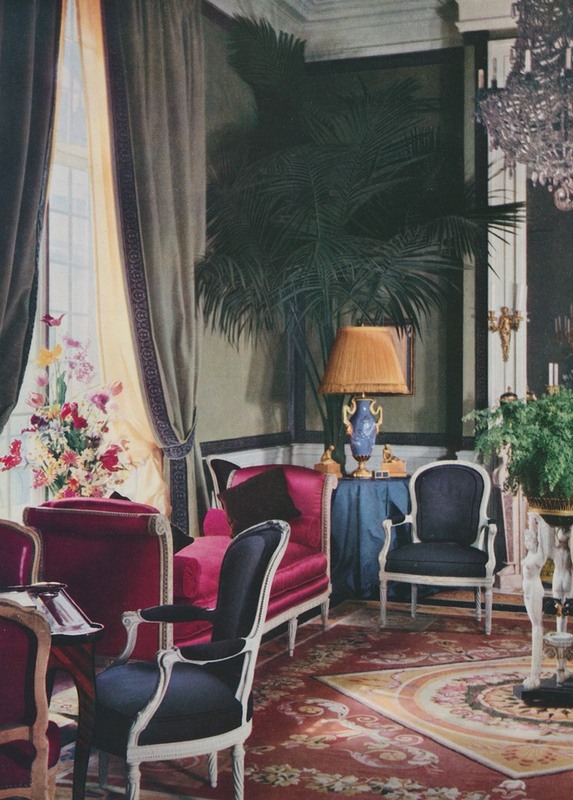 Dior's home featured the work of designers Georges Geffroy and Victor Grandpierre, both the ne plus ultra of French decorators. 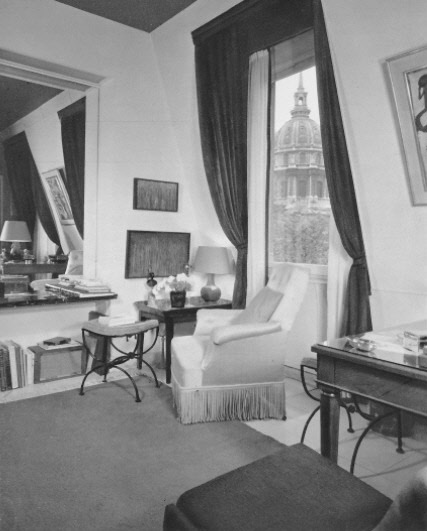 I think you'll agree that M. Dior's home was as elegant, and well appointed, as the clothes which made him a legend. 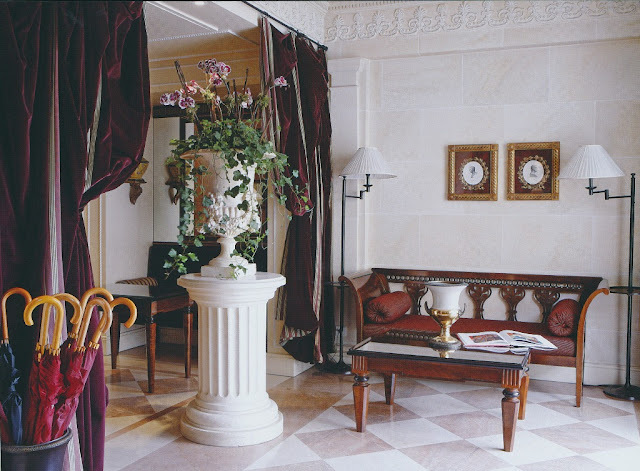 The entrance hall to Dior's l'hotel particulier. Note the emerald green shantung that was used for both undercurtains as well as hangings along the stair rail. 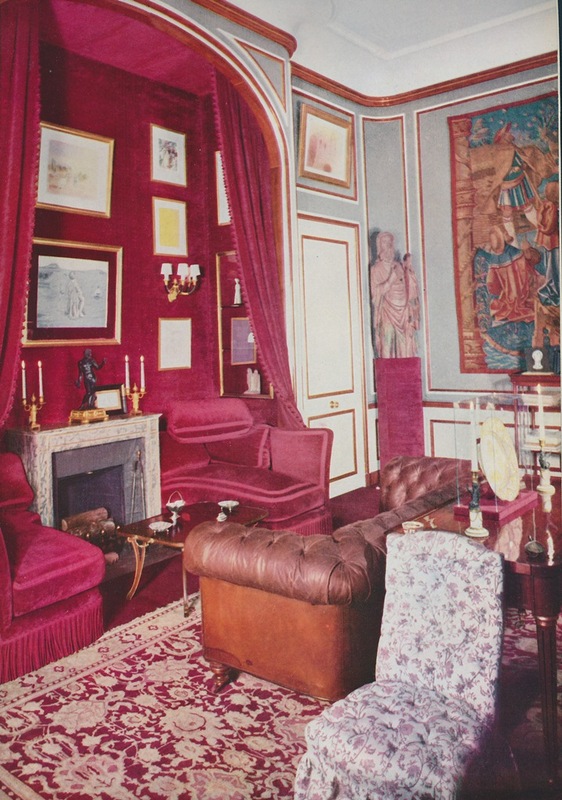 Le Salon. 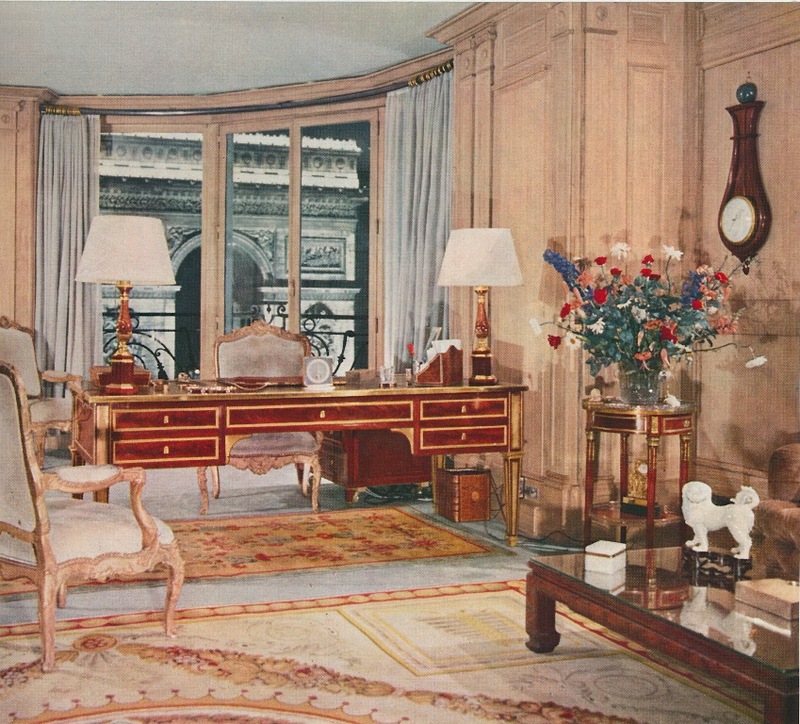 Decorated by Geffroy, the room featured an antique Aubusson rug and a Sèvres jardinière. Dior's Winter Garden which also served as a fumoir. The drawing room was decorated by Victor Grandpierre. 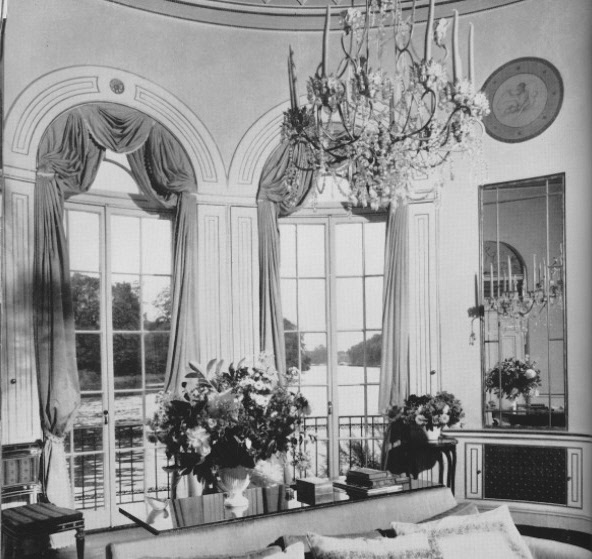 Dior's Louis XVI bed with baldachin. Also in the bedroom was this Louis XVI bureau plat. This hall led to the bath. 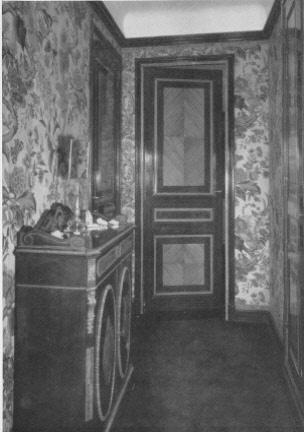 The doors were painted in the faux bois style. 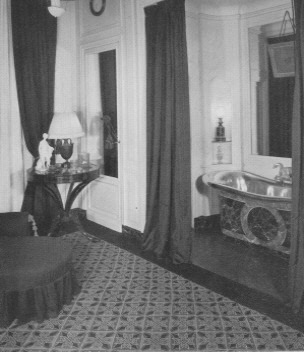 Dior's bathtub was painted to mimic green marble. 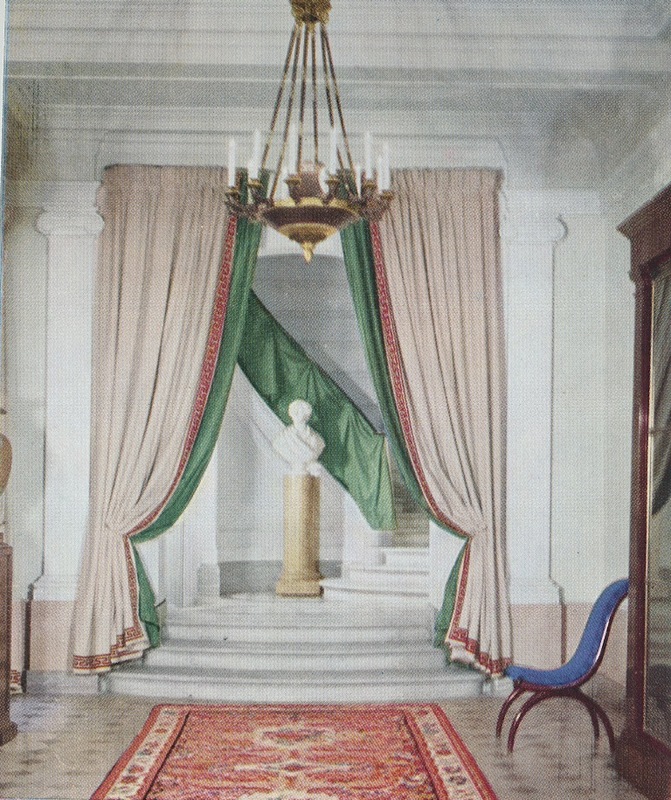 The curtains that framed the tub alcove were made of emerald-colored faille. 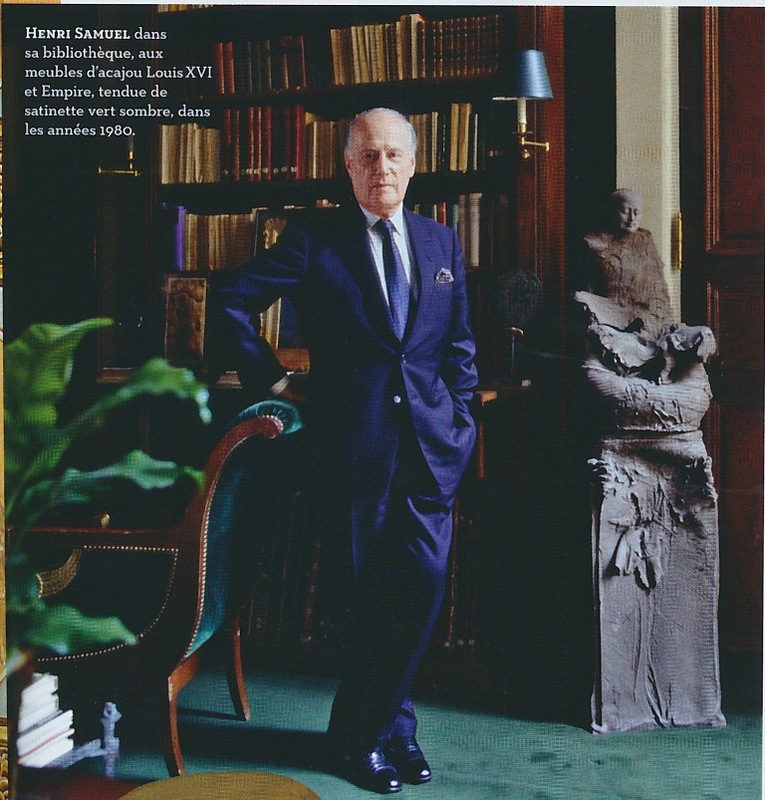 Did you read the April issue of French AD? 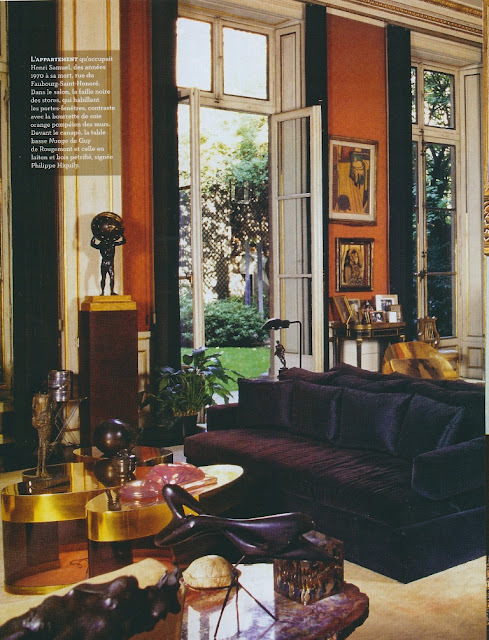 If so, you probably saw the article about the late French designer Henri Samuel. 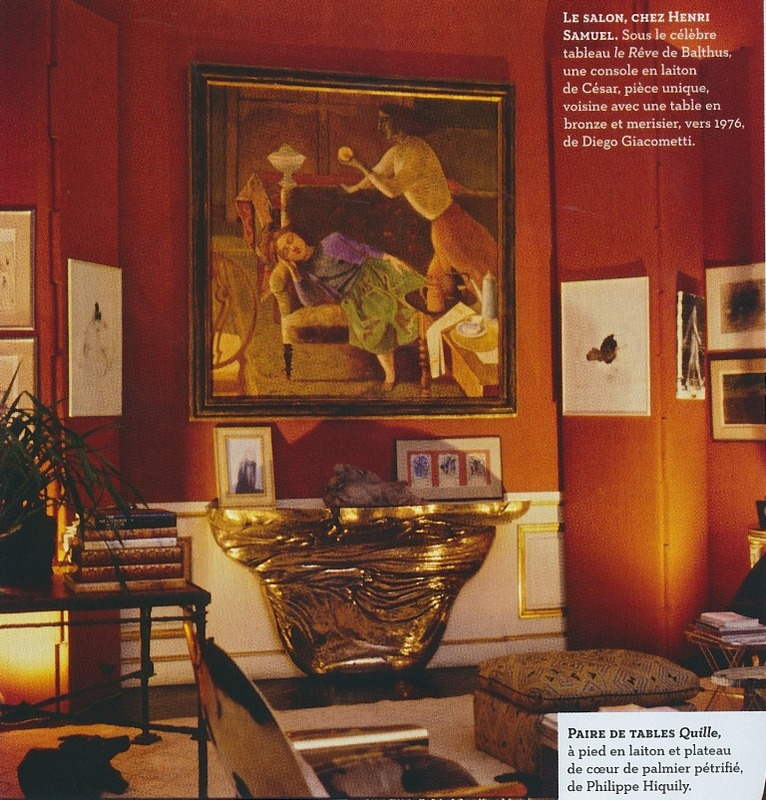 Samuel was one of the all-time design greats, having created interiors that were, and still are, the epitome of French chic. 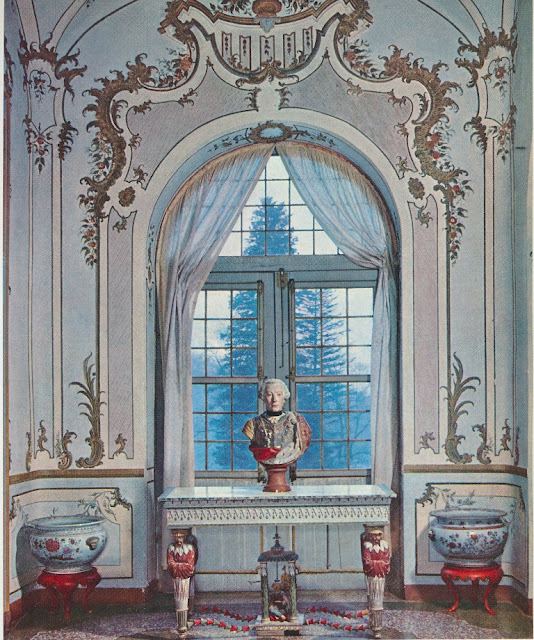 Although some of his work could be described as grand (his work for the Gutfreunds, for example, was notable for its tasteful splendor,) not all of Samuel's work was quite so lavish. His own home, seen here, was supremely sophisticated and yet, a tad bit more relaxed than what one might expect. Perhaps you could liken Samuel's casual decorative gestures to a blue blazer, Hermès pocket square, neatly pressed blue jeans, and loafers rather than a hoodie, sweatpants, and flip-flops, an outfit which is, unfortunately, most people's definition of casual. 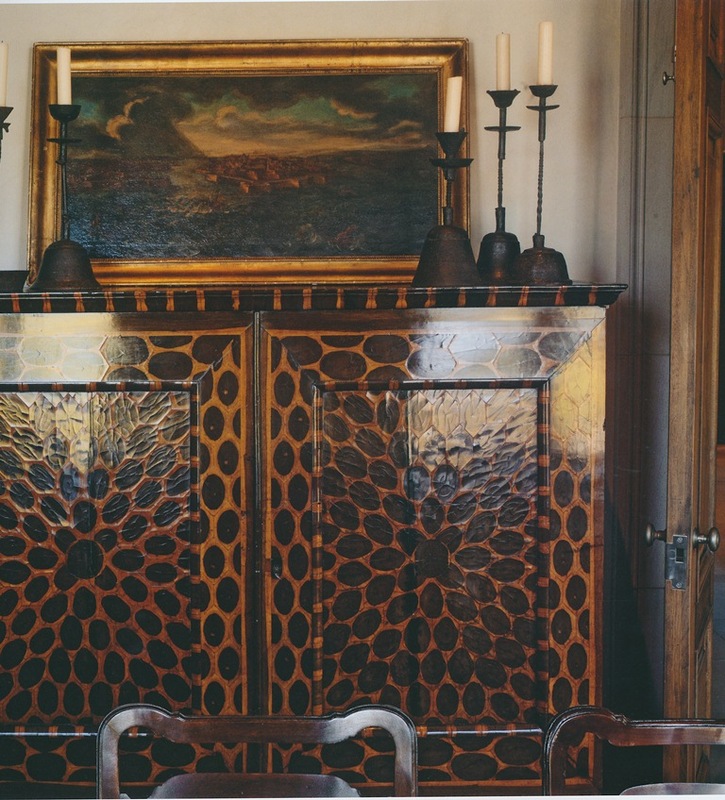 While Samuel could craft some purely traditional interiors, he was equally drawn to contemporary furniture, as is evidenced by the modern pieces with which he lived. Samuel was very adept at mixing, say, Guy de Rougemont-designed furniture (like that brass cloud table, below) with antiques and refined accessories in such a way that these super-sleek pieces were elevated to the sublime. 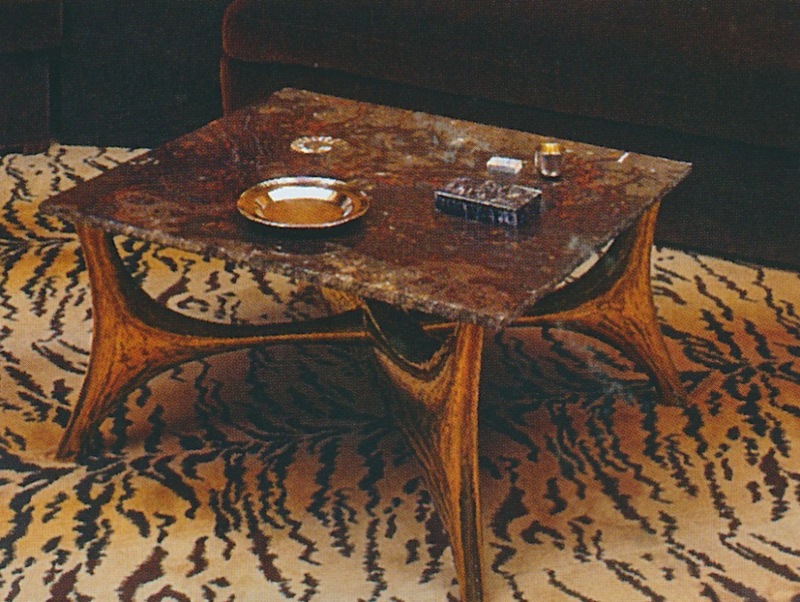 I hate to say it, but in lesser hands, this type of contemporary furniture is often used in ways that ultimately look a little seedy, and seedy is a word that will never describe Samuel or his work. If you missed the article, take a look below. Although some of these photos have appeared in a few design books, it's important to revisit them again. This is the work of a true master. 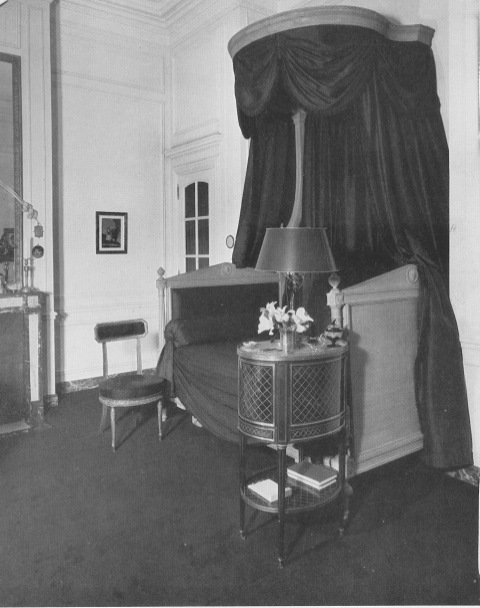 The salon of Samuel's apartment on Rue du Faubourg Saint-Honoré, Paris. 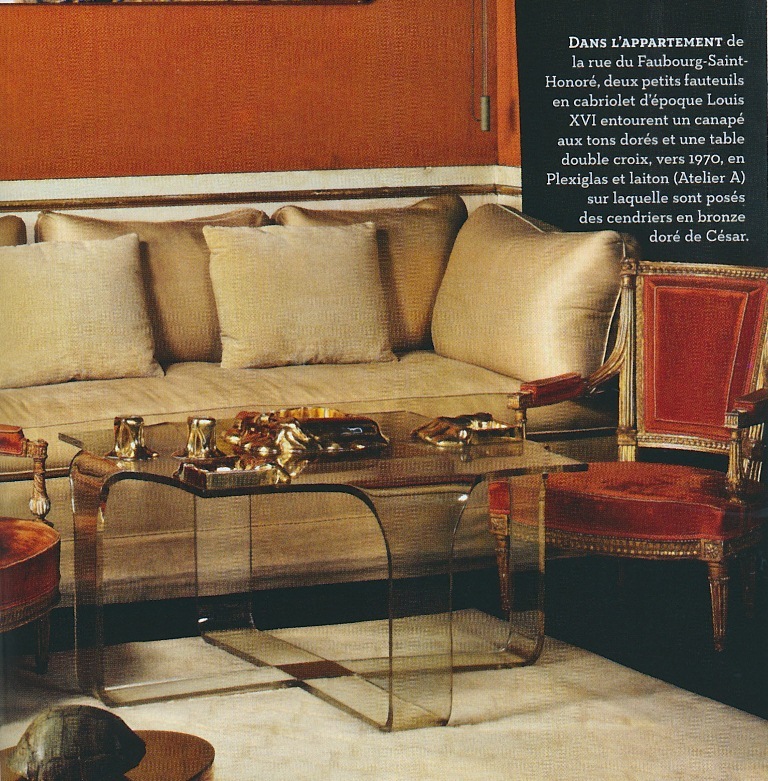 This snazzy Philippe Hiquily table resided in a Munich apartment decorated by Samuel. A Plexiglas and chrome Mouchoir table by François Arnal and two upholstered gondola-style chairs once decorated Samuel's library. All photos appeared in the April 2013 issue of French AD. The period between the World Wars has always fascinated me, and for a number of reasons, too. 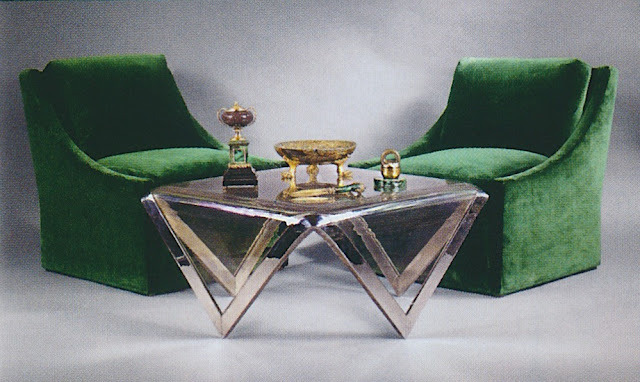 Fashion was never chicer, homes never looked more cocktail party ready, and cars reached the pinnacle of their sleek elegance. But the other reason for my interest is that this era also saw a lot of innovations that captured people's imaginations. 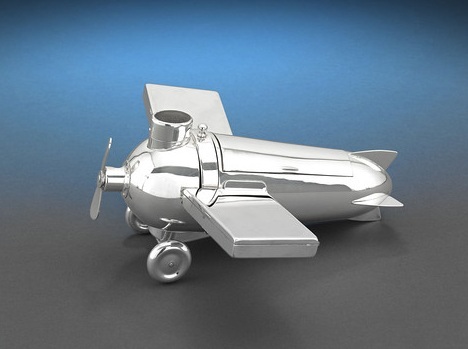 Take, for example, the airplane. 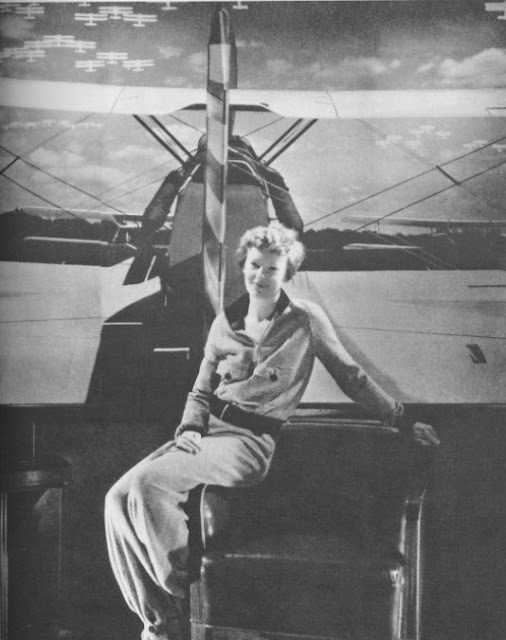 During the 1920s and 1930s, many social swells were besotted with the airplane, a fascination that was fostered by no less than Vogue, which encouraged its female readers to buy their own recreational planes. (As one Vogue article noted, "As surely as the woman of yesterday was born to ride in a limousine, the woman of today was born to fly in an aeroplane.") A number of society ladies engaged in such high-flying pursuits, including the Duchess of Bedford, who unfortunately disappeared in her plane during a trip from Woburn Abbey. One had to dress the part, wearing aviation attire designed by Poiret and Patou. 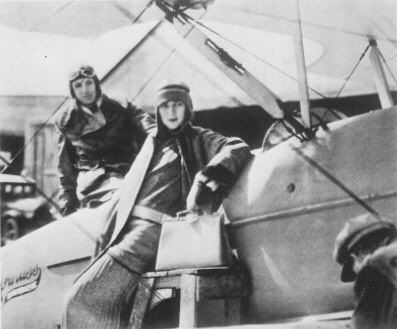 In fact, the Vicomtesse de Sibour (née Violette Selfridge, daughter of Gordon Selfridge) went flying around the world with her husband, and because their small plane meant small luggage, Violette brought along four beige Patou outfits to get her through the journey in style. 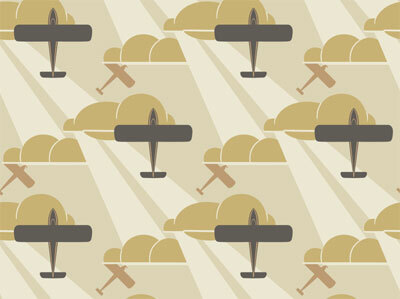 Airplanes, or rather, the airplane motif, sometimes made their way into the home, appearing on wallpaper and fabric. One such wallpaper, which you'll find below, was Aeroplane. Designed by Raymond McGrath, an Australian architect, during the early 1930s, the paper was thought to have been conceived for the house of an aviatrix. (The house, referred to as Rudderbar, was never built.) I can just see this paper in the late 1920s home of the fictional Phryne Fisher, who, like many of her trailblazing female counterparts, knew how to pilot a plane. 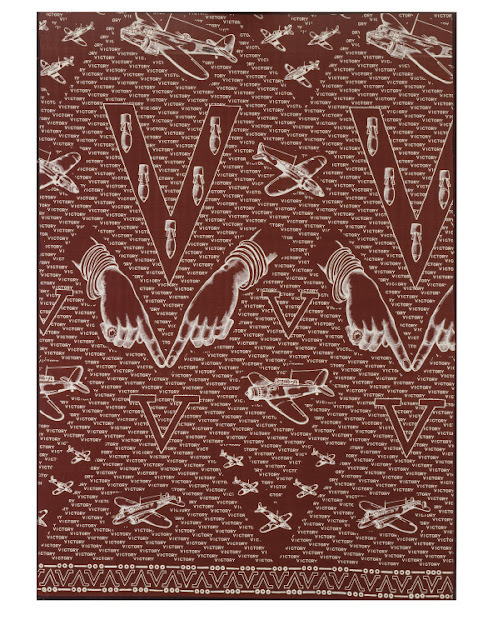 As World War II approached, the airplane motif began to appear as a symbol of a different kind of freedom, one from Nazi tyranny. Patriots, both in the U.K. and here in the U.S., proudly wore airplane-emblazoned attire as both an act of support for their troops and of defiance against the enemy. Although airplanes may no longer hold the same appeal that they once did (frankly, they make me think of germs spreading through the air and passengers walking barefoot to the bathrooms,) it's interesting to see how they once inspired fashions for the body and for the home. P.S.- If you want to watch a brief 1928 film clip that shows Mr. Selfridge sending off his daughter and son-in-law on their airplane trip around the world, click here. 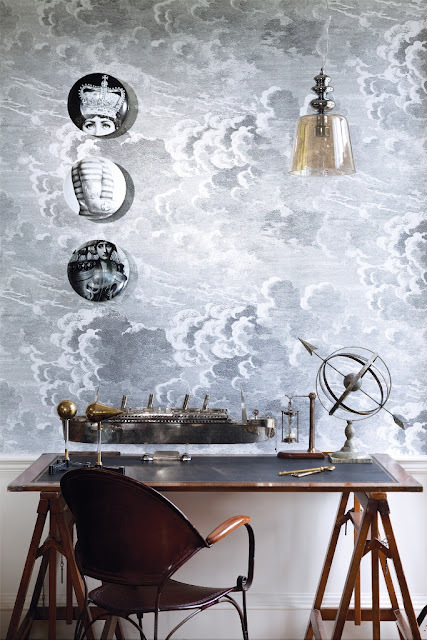 Aeroplane wallpaper, designed in the early 1930s by Raymond McGrath, is still available today through Bradbury & Bradbury. In 1926, Vogue suggested wearing a "knitted chiné woollen suit by J. Suzanne Talbot" when flying. 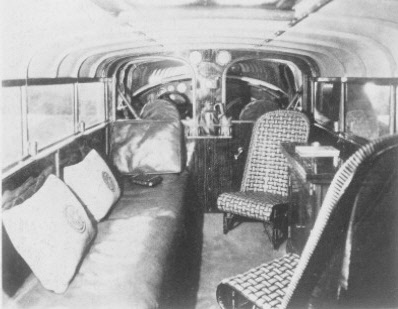 The interior of John Hay Whitney's two-motored Sikorsky Amphibian looked more like a residential interior than a plane. 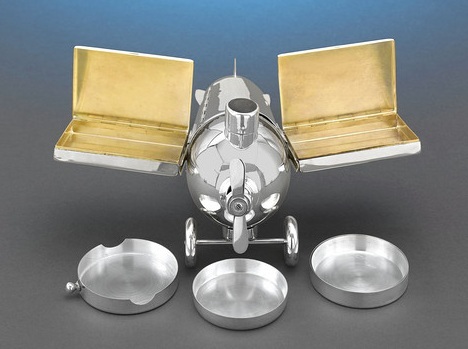 An Art Deco Airplane Smoker's Companion, designed by J.A. Henckels in the 1930s, is available through M.S. Rau Antiques in New Orleans. 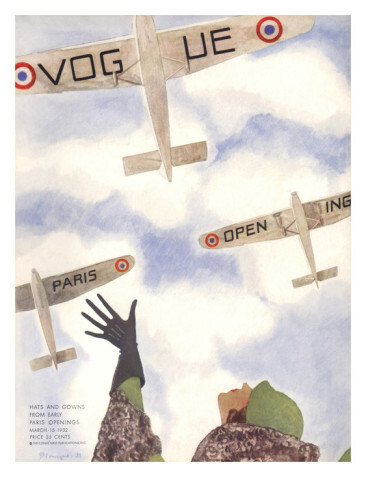 Vogue featured planes announcing the Paris openings on their March 1932 cover. This image is available for sale as a print through the Conde Nast store. Photo at top: Amelia Earhart, the most famous aviatrix of all. 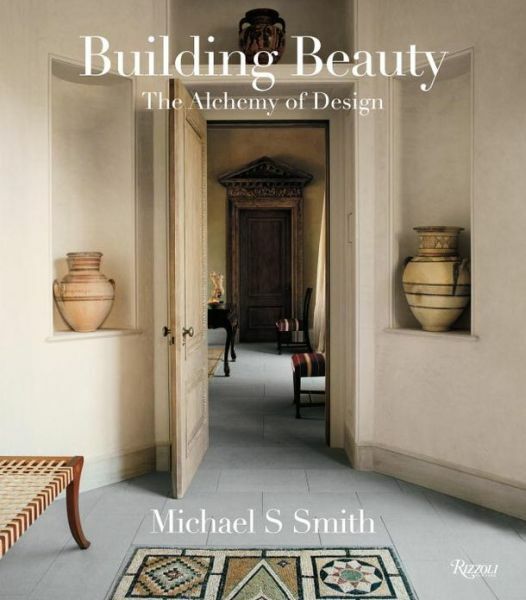 Recently, I had the opportunity to hear Michael Smith lecture about his new book, Building Beauty: The Alchemy of Design. Prior to the event, I knew of the premise of the book, which chronicles the evolution of a house from conception to reality. But until I heard Michael speak, I had not realized how truly special this home really was. Built to evoke a Palladian villa, this Malibu, California house was a labor of love, one seen through to fruition by the homeowners, the designer, the architect (Oscar Shamamian), the contractor, and various artisans. 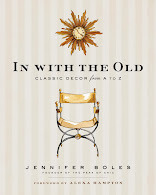 The tales that they share are the heart of this book, and they give much insight into what makes a spectacular home. But what I find to be most remarkable about this story- and what intrigued the most about Smith's lecture- is both the care and the detail that was lavished on this house. 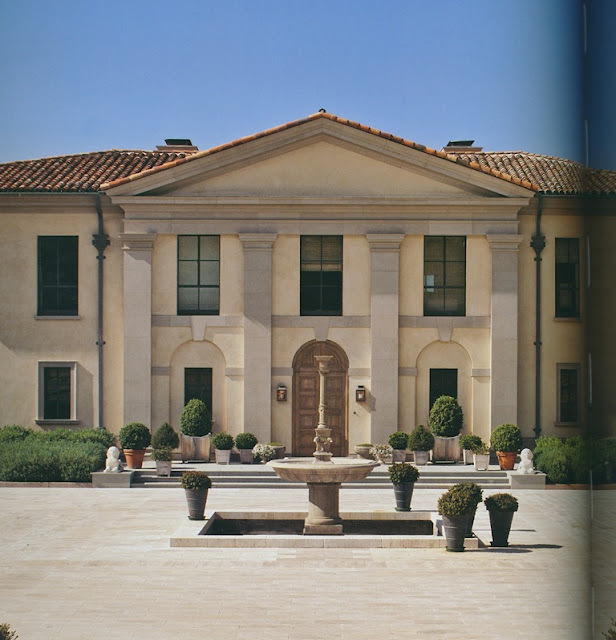 From imported stone to mosaics to a smattering of furniture once owned by Bill Blass, nothing but the best would do for this house, although there was nothing ostentatious in the result. It all worked well together splendidly. 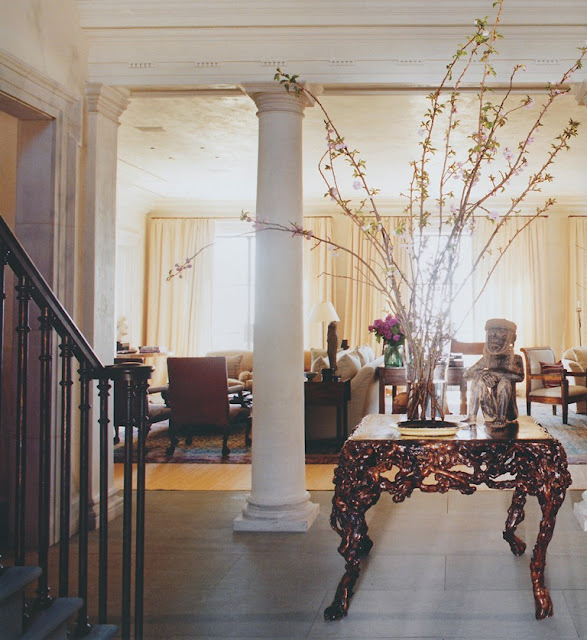 As most of you know, the house has since been sold to new owners and the contents of the home were auctioned off by Christie's last month. Thank goodness that we have this fascinating book that documents this one-of-a-kind house. © Building Beauty: The Alchemy of Design by Michael S Smith, Rizzoli publishers, 2013. 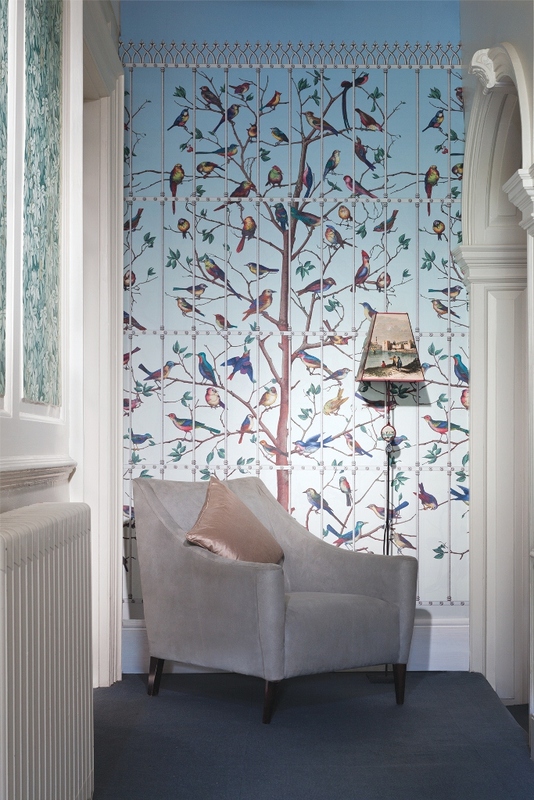 Over the last ten or fifteen years, there has been a lot of clucking over the popularity of hotel-inspired residential design. I scratch my head every time I see a home that could be mistaken for a W hotel. What's fine for a hotel is rarely good for the home, where comfort and, more important, the homeowner's personality should be in abundance. 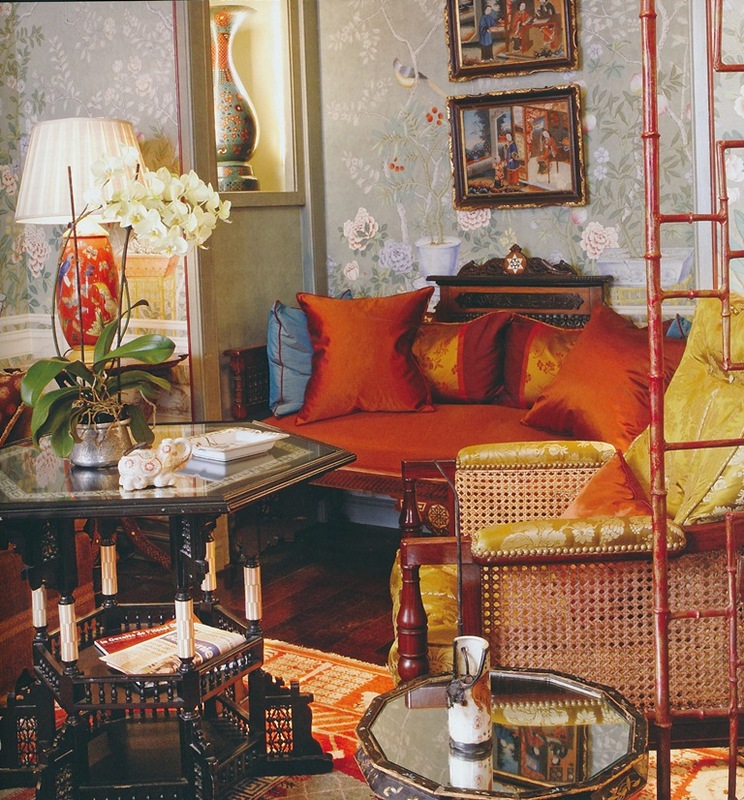 Except, of course, if one's home was inspired by the hotels featured in the terrific book, Parisian Hideaways: Exquisite Rooms in Enchanting Hotels. I have mentioned this book before, but upon reading it again over the weekend, I felt it was worth a revisit. 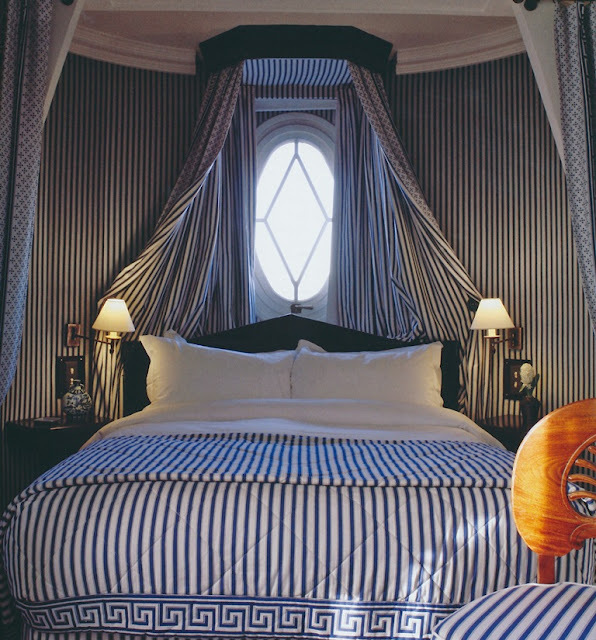 The beauty of these hotels is not just that they are incredibly chic, but they look like residential interiors. These are the kind of hotels that I pine for when I am stuck at one of those slick, too-cool-for-school hotels where everything seems so impersonal. 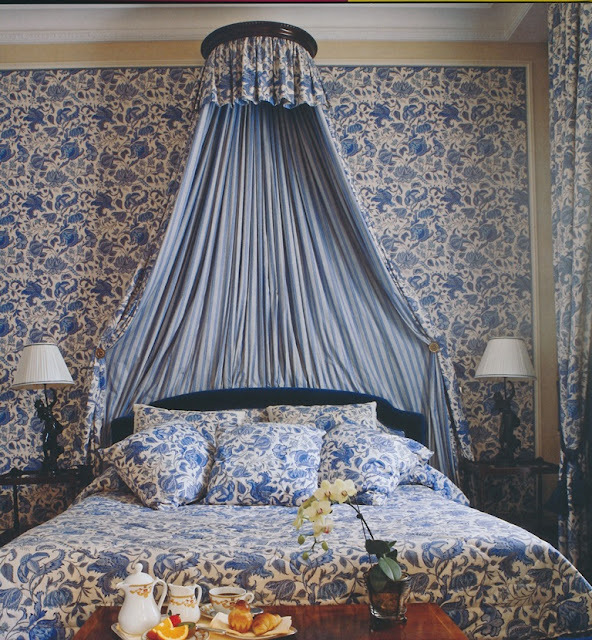 When I'm staying at a hotel, I want cubby-hole sized bars, canopied beds, jewel-box libraries, and boiserie panels. And when I'm at home, well, I want the very same. Photo at top: The Salon at Le Daniel, which boasts custom-painted wallpaper by de Gournay. The Ming Suite at Dokhan's. The Entry Hall at Grands Hommes. 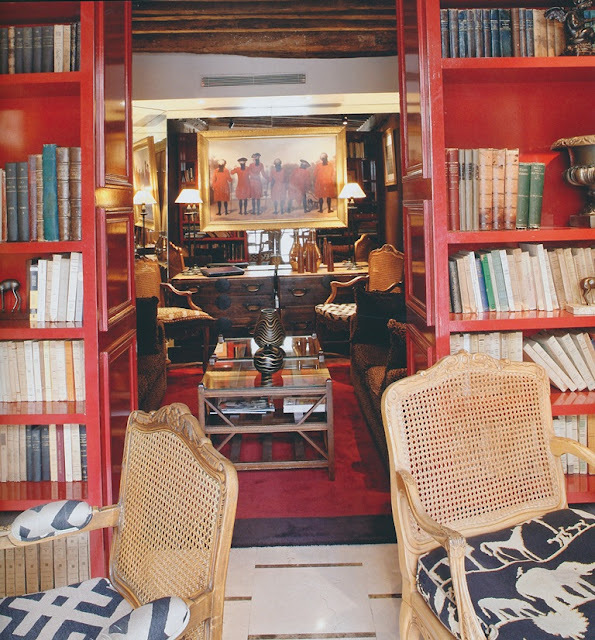 The library at Relais Saint-Germain. 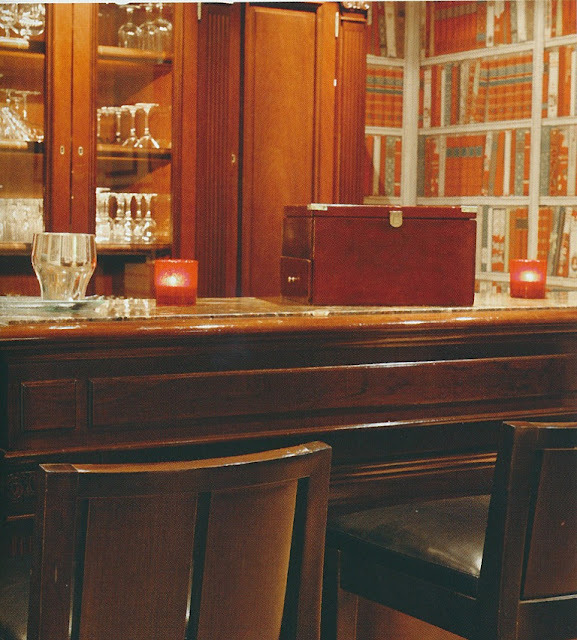 The bar alcove at François 1er that is papered in Brunschwig & Fils' Bibliotheque wallcovering. 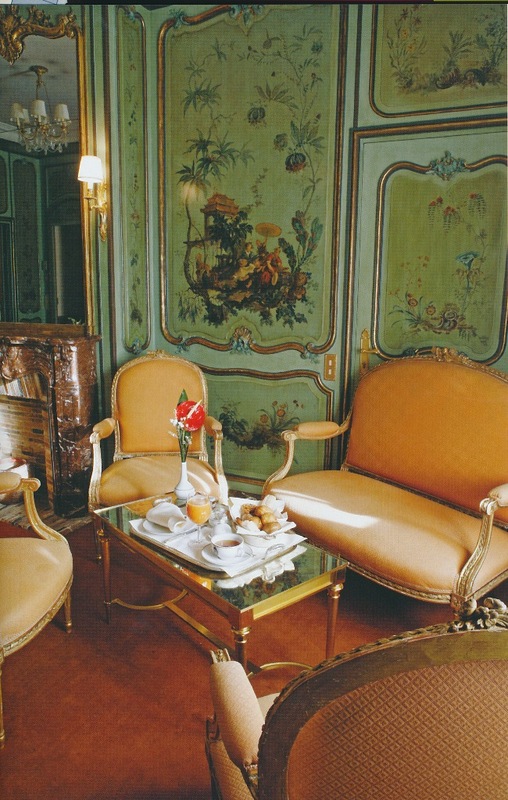 The Raphael suite at Hôtel Raphael with its 18th-century Chinoiserie paneling. 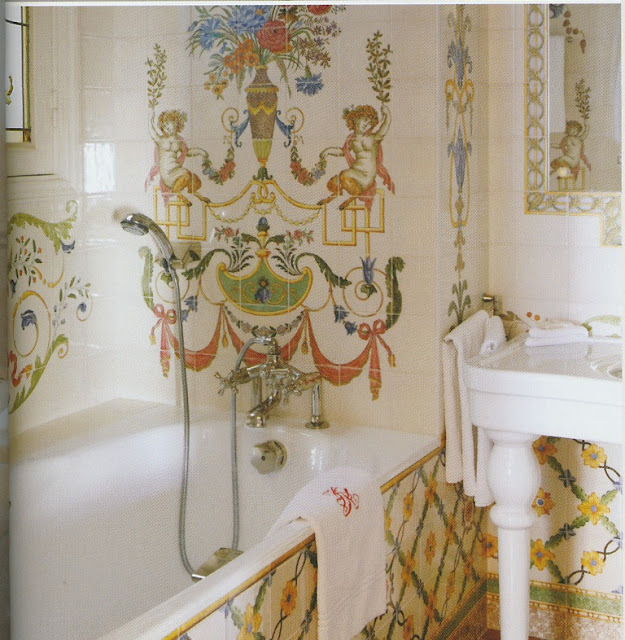 Also at Hôtel Raphael is this charming bath. Suite 10 at San Regis. All photos from Parisian Hideaways: Exquisite Rooms in Enchanting Hotels by Casey O'Brien Blondes.